Times like these I am relieved I have sons. Dressed this way, Barbie would no more be the first one with the scoop than Elizabeth Hasselbeck would be the first one picked to interview a visiting dignitary over Barbara Walters. But I guess a little girl can dream. This is where I get sick. OK, so I grew up wanting to be Brenda Starr or Lois Lane. While everyone I knew wanted to be a ballerina or a fireman, I wanted to ask questions. And write stories like Brenda or Lois. But those idols looked like Golda Meir compared to the tart news anchor coming out in time for the holidays for just $12.99. Never mind I have taught more than 1,000 woman in 14 years to be journalists at the Medill School of Journalism and have emphasized and tried to role model for them what it means to be professional. I have had the dressing for an interview chat with students, most all of whom understand what not to wear to ask questions of strangers and cover a news conference. Occasionally, I have had the “have your shirt meet your pants” conversation for those students who like to bare a midriff in class. Never have I ever suggested they turn out for a story in a sparkly camisole, skin tight skirt, high heels and a jacket. I have never told anyone or been advised that pink is a power color. What I tell students is you want to be remembered for your journalism, nothing else. 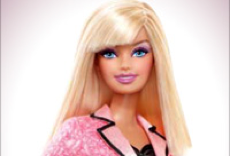 I guess as a journalist and journalism professor I can take solace in the notion that this News Anchor Barbie was the “first Barbie profession chosen by a global vote.” When you scroll through the other options– computer engineer, rock star, pizza chef (pizza chef? ), dentist, kid doctor (can’t you call it a pediatrician? ), race car driver (because there are so many of those), newborn baby doctor (again, what’s up with the pediatrician? ), ballroom dancer (tell Bristol Palin it’s a real career), bride or babysitter– I guess News Anchor Barbie is a noble choice. My sons are now 21, 19 and 16 and heading toward real careers. Weldon will graduate in May from college with a double major and is headed to graduate school in Spain in translation. Brendan is majoring in business. Colin may go into sales. He’s still in high school. When my youngest, Colin, was about 5, he said he wanted to be a jet ski driver. He insisted it was a career, I gather after the visit to the Wisconsin Dells. He assured me people would pay money to witness him drive a jet ski in front of them back and forth, back and forth. He knew to wear a wet suit. At least he would be dressed properly. I am all for giving young girls a goal. I wanted to be a journalist from way back when. Probably since about 7 or 8 years old. I also wanted to wear pretty clothes and I dressed my Barbies, Midge, Francie and Skipper in all the teeny tiny tight dresses and plastic high heels my mother would buy. But I knew better than to think those two worlds could collide. I mean, seriously, Barbie totally dressed for Ken. Just as I know better than to stand in front of my journalism students dressed like Nicole Richie as ridiculed on gofugyourself, I know to interview someone dressed like a real journalist, not a Barbie doll. Maybe next year Mattel will come out with Barbie I Can Be… Something Sensible. You really want my story? My answer is that I see it in my mailbox every month, take it out, flip through the pages and sometimes laugh at the gaunt 20 year-olds teetering in impossible heels with ratted wild wicked witch hair. Sometimes I take the fragrance inserts and rub them on my wrists. I read the profiles. Sometimes I see a pair of shoes that make me swoon. But they are right, it is “apart” from my life. Not an integral part of my life. It is a magazine. And no matter how much I loved the movie, “Sepetember Issue,” I believe deep in my soul that Anna Wintour cares not a wink about my story. The disingenuous attempt at inclusion feels false. No one wants Vogue to be about everywoman. For that I can look in the mirror. Still, it seems so many outlets want my story. Your story. Your narrative. Our narrative. Each morning my Google Alerts for “everyman” include up to 20 entries of mentions from the trend toward “everyman” Oscars this year to pity for the downfall of Tiger Woods as Everyman. I don’t think so. The overuse of the word and the notion of “we’re all in this together” supports my notion that we are immersed in a culture where the avergae citizen is more appealing and newsworthy than an elite celebrity. Sometimes the moniker is not deserved or sincerely applicable. Take Scott Brown, Republican’s No. 41. He is no Everyman for me, even though that has become his subtitled reference. Show me an everyman who poses for Cosmopolitan and wins a Senate seat. John Edwards was not an everyman either. He was a cheating slug. Is he really an Everyman? Pizza Hut and Comcast have everyman advertising campaigns, the late Walter Cronkite had everyman appeal, Barack Obama was an everyman and now not so much. Books, magazines, museums, ads, movies, pols, everyone and everything want to appeal to everyman. Some of it I don’t buy. Some of it is just slapping a popular title on anything and everything. Everyone is not an everyman.